Dalvin Cook is expected to be at 100 percent after the knee injury that ended his rookie season; Latavius Murray gives the Vikings a different look when he's in the game. Note: This is the second of four offseason snapshots looking at the peaks and valleys of key 2017 Vikings contributors. Part I: Harrison Smith. Dalvin Cook’s first and 74th carries, unfairly ominous bookends to his NFL rookie season, might have been the same play. With two tight ends tucked closely to the left tackle, a weakside handoff and inside zone run awaited Cook on each snap. The results, one yard against the Saints and 10 yards through the Lions, showed an heir and offensive line quickly outgrowing Adrian Peterson’s shadow. Still the potential was greater for each play, the first a resounding dud and the last a season-ending torn ligament in Cook’s left knee. Cook started to reward the Vikings for trading up to make a second-round pick of the Florida State star nearly one year ago. They gave him nearly every chance to. Despite the talk of a backfield-by-committee heading into last season, the Vikings handed Cook the reins. He played more than 70 percent of snaps as a three-down back, being given the opportunities to improve his deficiencies like focus drops and pass protection on the field. There’s little reason to think Cook’s role will change as he’s expected to be ready for training camp this summer. So let’s take a closer look at Cook’s game, including his next steps and pairing with Latavius Murray as the likely 1-2 in the Vikings backfield. Cook slipped to the Vikings because of pressing question marks: injuries, fumbles, off-field concerns, but the elusiveness that made him a first-round talent translated almost immediately to the NFL. Only after a bumpy first quarter, which saw Cook gain a total of one yard on his first four carries. Then Cook hit a sweet spot: the edge. A sweep to the left resulted in a six-yard gain, despite initial pressure from Saints defensive tackles widening his path. Outside runs brought out the best in Cook’s unassuming 5-foot-10 stature and strong field vision. He darted between gaps, setting up defenders by aiming for a crease and sprinting around it. He also proved to be a difficult 213 pounds to bring down with 14 broken tackles that ranked fifth among NFL backs in Weeks 1-4. So the Vikings’ run game, the NFL’s first to go worst-to-top 10 in rushing yardage since the Colts drafted Marshall Faulk in 1994, is eagerly awaiting his return. The opening two clips of the video below show Cook’s pre-knee injury elusiveness. The first: Cook needs to widen his run while four yards behind the line of scrimmage, still picking up 33 yards. The second: Cook uses a hole off right tackle to set up two Steelers defensive backs for a 25-yard gain. Cook’s next steps will include rounding out his game as a receiver and pass protector. The Vikings didn’t limit his exposure there. He came out of the gate with four snaps at receiver and five targets overall in Week 1. His issues were just as immediate. Cook dropped three passes in 3.5 games and failed to connect with Sam Bradford or Case Keenum at times, including the third clip (:52) below. Cook’s pass pro was also a work in progress, an area the Vikings could miss Jerick McKinnon’s proficiency. 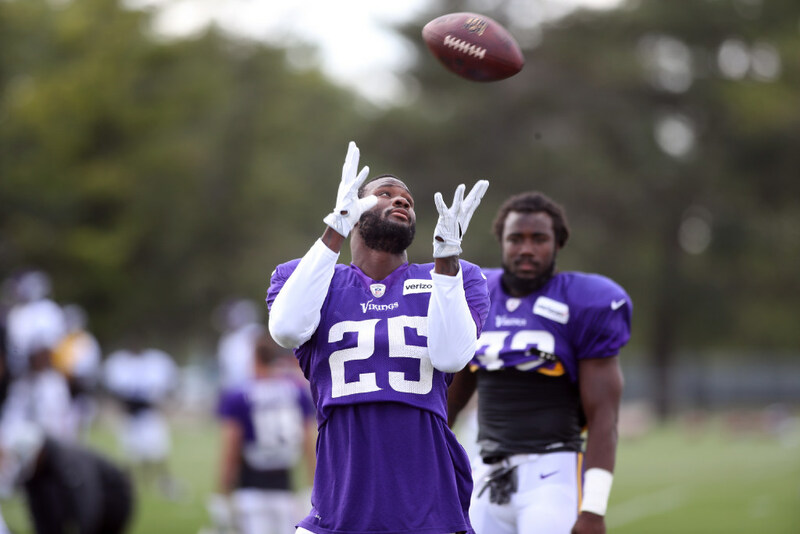 Latavius Murray’s contract may be a target if the Vikings are trying to pinch pennies in the next month. His $6.35 million salary cap is the third highest on the Vikings offense (fourth after a QB signing), and Murray should maintain a secondary role next season. The Vikings are on the clock. More than $5 million of Murray’s salary becomes fully guaranteed on March 16. On the field, Murray was a late bloomer for the Vikings after seeing just 17 snaps in Weeks 1-3. Ankle surgery last spring limited his training camp, putting him third in the pecking order. His recovery was blamed for a slow start with 80 rushing yards in his first 2.5 games in the mix. But his vision and feel behind the Vikings offensive line wasn’t fluid, evident below in the opening two clips. Murray broke through against the Ravens, three weeks after Cook’s injury. Third clip: Murray cuts backside for a 35-yard gain. His best asset – size at 230 pounds on a 6-foot-2 frame – is even harder to grip when Murray gets his momentum flowing opposite of the defense. Vikings backs really had to earn rushing yards in 2017, whether due to inconsistent blocking or defenses not respecting Case Keenum’s arm. Murray got rolling in the season’s second half, needing to rank seventh in yards after contact (386) in the final eight games while leading the Vikings with 842 rushing yards. So the Vikings’ run blocking has room for improvement. 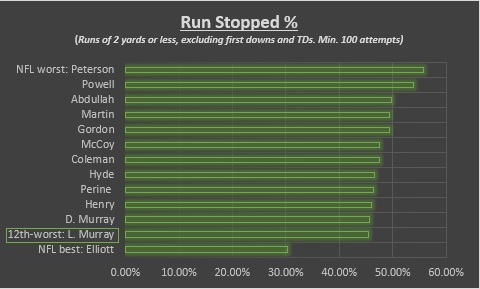 Too many of Murray’s carries – 45.4 percent to be exact – were stalled for a gain of 2 yards or worse during the regular season (excluding first downs and touchdowns). That ranked 12th worst among all NFL backs, and just ahead of McKinnon’s 42 percent of stopped runs. You’ll see a familiar name atop this list, made possible by Pro Football Reference. With the anticipated exit of McKinnon, who seeks a bigger role during his first dive into NFL free agency, the Vikings will likely lose a very reliable third-down back. As a rookie, Cook wasn’t pigeonholed into certain situations while playing 51 of 65 snaps in his NFL debut. But where Murray could spell him is third downs. Murray’s reliable hands and feet as a pass protector and receiver (15 of 17 targets caught last season), make for another reliable option, if not as electric as McKinnon. The Vikings ran primarily under center (roughly 76 percent), which set up one of the league’s most active play-action passing attacks under Case Keenum. They may have to reconsider that approach depending on the decision at quarterback, and Cook was more effective out of the gun (7.1 yards on 20 att.) than under center (3.9 yards on 54 att.) in his limited snaps. Whichever the Vikings offense focuses on, they’ll be able to run inside zone schemes for both backs. The opening two clips show as much below. First clip: Cook sidesteps pressure from the nose tackle for a 10-yard gain up the middle on the Steelers. Second clip: Murray’s second cut off Berger’s backside sets up a 34-yard run against the Rams. Third clip: Murray slides across the formation to pick up Panthers DE Bryan Cox Jr. in pass protection. The fourth and final clip shows potential for Cook and the Vikings screen game, which was revitalized by mobile center Pat Elflein last season. Elflein slips on this 11-yard gain against the Buccaneers, but the rookie later made that block in his games ahead last season.